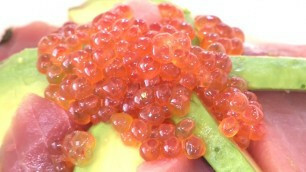 We are going to make healthy KAISEN DONBURI(Sashimi Bowl or Sushi Bowl) containing tuna slices and avocado pieces on top of cooked rice seasoned with vinegar. Ingredients include cooked rice, red flesh slices of raw tuna, salmon roe, avocado, toasted nori (laver) sheets, soy sauce and wasabi. Yellow-fin tuna and/or big-eyed tuna will do. But fresh fish is more delicious than defrosted fish. Avocado that is black, matured and slightly smoother is recommended. To make vinegar mixture for sushi, stir vinegar, sugar and salt until well blended. If making vinegar mixture for sushi is somewhat of a hassle for you, or if you are not sure of the outcome, it is simple to use pre-seasoned vinegar mixture products on the market. Remaining vinegar can be used as a dressing by adding salad oil or olive oil.